The more I learn about faceting, the more I think there is some kind of mysterious, and sometimes aggravating property to polishing. Maybe the stone is picking up the energy signals from the faceter, or the alignment of celestial bodies has to be just right. Whatever it is about polishing that makes it so variable, I've come to the conclusion that if a technique works for you, stick with it. That's because what works just dandy for one person is a nightmare for others. LapidaryPro diamond is the highest quality synthetic diamond available. Unlike other diamond that rounds out when worn, LapidaryPro diamond is friable and retains sharp edges that continue to cut, even as the diamond particles wear down. So, less diamond is needed and it lasts longer. 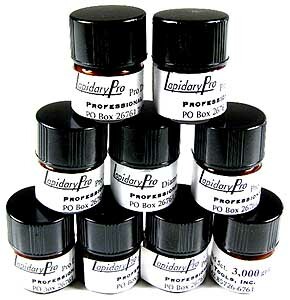 LapidaryPro diamond is also very finely graded, which means the powder is extremely uniform in size. So, it cuts like one would expect it to, and with less of that problematic scratching that is so well known to those of us who use loose diamond for grinding and polishing. 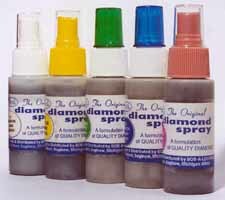 Italdo Diamond Spray was the first diamond spray on the market and it is still the best. Italdo contains the finest friable diamond, which continues to expose a sharp edge to facilitate quick polishing, but without scratching. Italdo uses the flotation method to grade their diamond grit. The floatation method sorts out different grit sizes with incredible accuracy. The result is quick pre-polishing and polishing, with no hazing or scratching caused by oversized diamonds. Italdo uses a special water/oil carrier that is ideal for ceramic laps. We highly recommend Italdo Diamond Spray on all types of pre-polishing and polishing laps. The spraying action is done by a pump, so it contains no harmful CFCs. This item can not be shipped outside the US.